I had a bag of tasty little plums from the Ann Arbor Farmers Market that were on the verge of becoming too soft, so I decided that another sweet treat was in order. 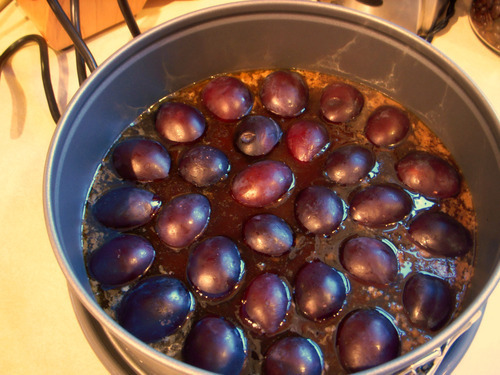 I’d made an upside-down fresh fig cake in Japan that I thought would adapt well to the plums, and indeed, they look quite happy swimming cut-side down in a pool of melted butter, honey, and brown sugar. Mmmmmmm. This recipe is from “Outstanding in the Field: A Farm to Table Cookbook” by Jim Denevan with Marah Stets, and can be found here. I think the recipe turned out even better this go-round, partially because I was baking it in a regular sized pan in real full-sized oven, rather than in a teeny cake pan in a tiny convection oven. 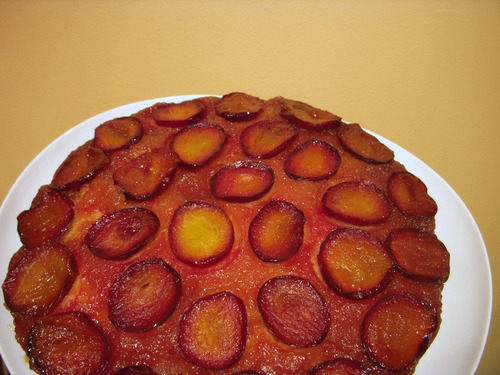 But also because the plums added a nice slight tang to the otherwise very sweet cake. Served with a glass of the apple cider that I’d been missing like crazy, this made for a decadent dessert…errrr……breakfast! This entry was posted in In the Kitchen (recipes & more) and tagged breakfast, cake, desserts, lindsay jean hard, local food, Real Time Farms. Bookmark the permalink.